Frame rate is capped at 33 FPS. Use the HDE mod to increase the cap. Does not include the contents of the expansions of the original version. Expansions available for the original release are not part of the HD Edition. Do not remove H3Intro.ogv (the intro cinematic), as the game will crash when it's not present. It's possible to skip the video in-game using Esc, or you can replace it with a zero-length file of the same format. Download and extract the zero-length video replacement from here. Replace <path-to-game>/data/LOC/EN/H3Intro.ogv with the downloaded file. 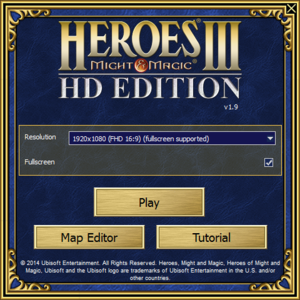 An unofficial mod is available for the game that adds several changes and maps present in expansions available for the original release of the game. games\ stores single and multi player save games. maps\ stores campaign save games. Certain screens remain in 4:3, e.g. 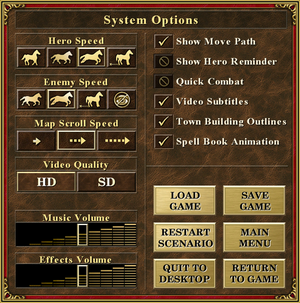 the town and battle screens. The UI is not adjusted to stay on the primary screen. The game's UI simply adjusts to cover the entire area. Not all videos have subtitles. To switch to a different language, right click on the game in your Steam library, go to Properties > Language and select the desired language. ↑ 1.0 1.1 File/folder structure within this directory reflects the path(s) listed for Windows and/or Steam game data (use Wine regedit to access Windows registry paths). Games with Steam Cloud support may store data in ~/.steam/steam/userdata/<user-id>/297000/ in addition to or instead of this directory. The app ID (297000) may differ in some cases. Treat backslashes as forward slashes. See the glossary page for details. 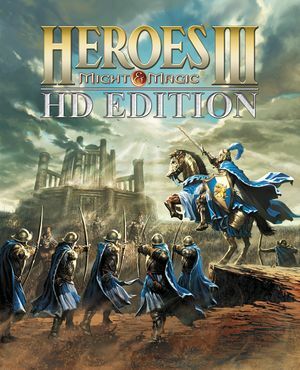 "Important note: Heroes III – HD Edition content is based on the original 1999 game: The Restoration of Erathia." Verified as working, created workaround for intro cinematic crash. Game will stretch to cover any resolution, but elements of the UI will remain locked to positions relative to borders.